This is the end result of a project to make the perfect glasses case, which began back in November last year when Tomasz Nosarzewski at Dunhill told me about the bespoke work he had begun doing at Bourdon House in London. Tomasz, whom I first met in 2010 at Dunhill’s Walthamstow factory, had begun doing bespoke projects for customers following a very successful trip to the Far East. He now spends every Thursday down in central London, making cases to carry perfume sets, encase car keys and hold gym kit for men that like purple crocodile leather. This glasses case is nowhere near as intricate or ostentatious. But it means a lot to me because I’ve found it very hard to get a well-functioning case in the right proportions, let alone anything with style. You can guess what the chances are of finding anything that is hand-sewn. So the result is a simple but, I hope you’ll agree, beautiful piece. Slim enough to fit in a jacket’s breast pocket when needed; padded enough to protect against most things short of being stood on. In green crocodile with that inimitable saddle stitching. 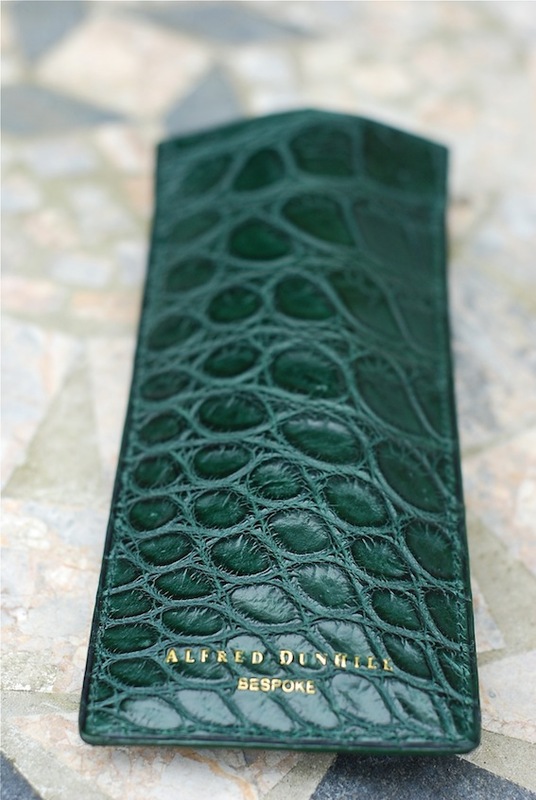 You can follow the discussion on Alfred Dunhill bespoke glasses case by entering your email address in the box below. You will then receive an email every time a new comment is added. These will also contain a link to a page where you can stop the alerts, and remove all of your related data from the site. Excellent case. Do you know from where they source their crocodile skin? Also could you please give an indication of the price? Beautiful color and choice of skin. Excellent concept and execution. Very nice. Is there a soft lining inside to protect your glasses – suede perhaps? Not quite as elegant as this, but Marinella very kindly sent me a glasses case made from their tie silk. Yes it’s lined with alcantara (synthetic suede). Great stuff. Marinella’s silk cases are lovely aren’t they? What an extraordinary way to spend money. I wish I could afford half the stuff on this blog. You lost me on this one. The cost depending on leather would be around £300-£500. Extravagant, certainly. That is truly a unique beautiful case. Congrats. I’m actually looking at buying a good quality glasses case for my father for his birthday, I’ve been searching but can’t find anything good. Any recommendations? Won’t be going for anything as extravagant as that, but am clueless as to where to start looking. Thanks very much. What are the dimensions of the case when it’s flat? Hi Simon! As I am currently in the process of ‘upgrading’ my glasses, I am also now looking for a quality leather glasses case (it does not have to be crocodile per se), thus I wanted to ask, if you have seen other reviewed makers here on the site do something like this and if so, could I ask for some suggestions?